Matt Lauer gets in first, between four and five o’clock, because he lives closest, coming from the East Side. Then Ann Curry, then Al Roker. Overall, there are about 150 people editorially—plus camera guys and directors and stagehands—and it operates like an airline. There’s a general expectation that every time it takes off, it will come back down. I would say that 85 percent of the staff are women—it’s a very mom-friendly environment. When Katie was around, it was a different dynamic. She was the only diva at the show. Matt is known as the germophobe of the anchor team. He walks around with a bottle of Purell in his pocket. He’s constantly out shaking hands with the crowd, and the minute he turns away, he’s Purell-ing his hands. If you ever walk in his office, it’s like a ­museum—he’s meticulous. The Today show and Good Morning America are at each other’s throats on a daily basis on booking efforts. There are maybe half a dozen full-time bookers. All morning, Matt and Ann are communicating with them. If Matt personally needs to make a phone call, or get on a plane to Italy, it’s these people who manage it. The booker job is intense. You have to sequester a guest in a hotel, knowing full well your competition is outside waiting. They’re completely manic, almost all under 30, voracious readers. They have to be on top of every story at all points of the day. When there’s a gunman in Ohio at five in the morning—what freelancer do I have that I can send to find this guy’s wife? That’s literally how this thing works. They’re responsible for having somebody on it. It’s a necessary tactic you have to take to win and stay ahead. Matt has, sort of, I don’t want to describe it as highbrow, but sensitivity about his journalistic credentials. He only wants to go after what he perceives as really important stories. Did he want to do Kim Kardashian filing for divorce? Absolutely not. He hates the seedy, gossipy stuff—but he has to do it. The blurring of the lines in booking guests has raised eyebrows in the business. They can pay for stories by incorporating them into the entertainment units and framing it as entertainment. When Michael Jackson died, Matt got the first interview with ­Jermaine Jackson at Neverland Ranch. Before the show, Jermaine evidently demanded money. Does Matt have knowledge that licensing fees are paid for videos? Of course. What he was worried about was, “I didn’t come here to have my pockets shaken out by Michael Jackson’s brother.” There were all kinds of things in play, like whether there would be a Jackson TV concert. In the end, the interview happened—though Today didn’t pay. These things are coordinated at such high levels—the president of the news division and above. After George W. Bush left office, everybody and their mother was dying to get the interview. You can imagine the ego wars. Matt was going to be the one to go after Bush. So he spent an entire day at his ranch. A couple of months later, the company says Jenna Bush is a new correspondent. The day it was announced, it was weird. She’s still there. A show like this is such a cash cow for NBC; they really study numbers like no other place. The succession planning for that show is key. And Matt has been rumored to leave the show at the end of this year, when his contract is up. 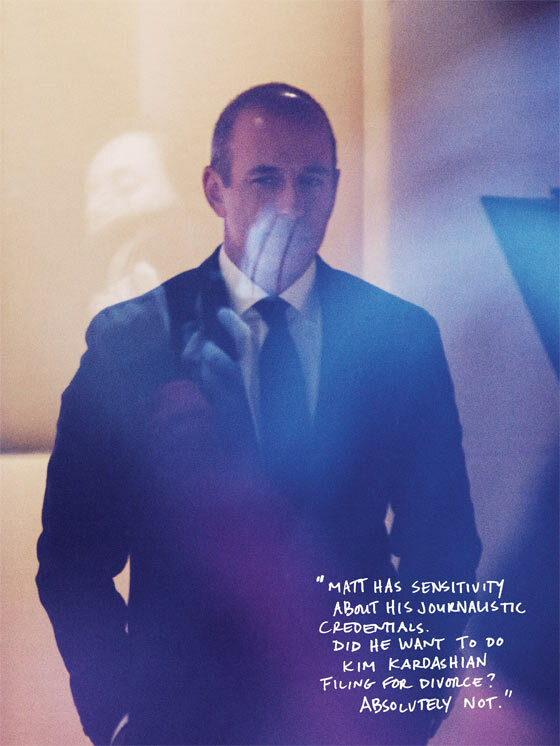 Matt right now is the highest-paid anchor in TV. For somebody like him to say, “Oh, I’m hanging up my hat”—I wouldn’t be surprised if they offer him $20 million. If the show’s audience doesn’t gravitate to Ann Curry soon, could NBC buck its own succession plan, much as it did with Conan and Jay Leno, and have Savannah Guthrie replace Ann? She’s got that girl-next-door quality, and Ann can sometimes come off as disingenuous in interviews. And I don’t see a situation where they could remove Ann and keep her at the network (she wouldn’t be happy staying on as a special correspondent, and she is no longer hosting Dateline). There would be nowhere else for her to go. Unfortunately, that’s the way those things play out.